Liberty (Libby) on the left and Freedom (Fred) on the right arrived just before the Fourth of July weekend (1999). They arrived in very good condition, but were quite vocal about the delayed delivery of their evening soaked monkey biscuits. They are always eager to come out to play, but not always eager to go back in. Generally they are surprisingly quiet, but every evening there is a "calling together of the flock." Their arrival here is the culmination of a dream that started 20 years ago when my wife (then in Vet School in Louisiana) treated the first WBC I had ever seen. His name was Paco, and he would respond to the command "Do the jerk, Paco" with clownish head bobbing. Now I have my own pair of clowns, and I already have had inquiries from my family regarding to whom they shall be willed upon the likely event that they outlive me. But then again, my great Aunt lived to 109. If I can duplicate that, they'll be 61. Fred & Libby live in California with Kim and Denise. 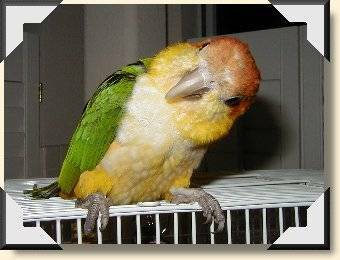 'Sister' Sherbet, hatched 1-4-98, likes a towel after her bath, her Happy Hut, and Brazil nuts. She wants to try out for the local school mascot, because the school colors are green, white, and orange! She's still learning her cheer, but she's definitely got the spirit! 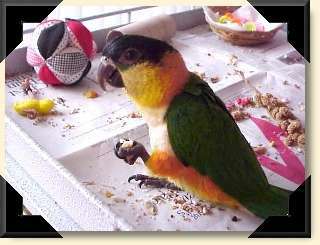 Sherbet lives in central Alabama with her birdy brothers and sisters in the home of Robert and Cheryl. Clarence has already established himself as a major player in our family. He insists on petting from everyone, and is amazing us with his deep voice. He already says "Pretty Bird," whistles tunes, and sings his own version of "Happy Birthday" with anyone willing to sing along. At only 6 months old, he has more personality than any other bird we have ever owned! Clarence lives in Texas with Melanie. Hi, my name is Mango (it should really be Fearless Fosdick!) I left Gloria's on 10/18/99 and I have had a very busy week. I have a bird new cage and LOT'S of toys to play with. Saturday I saw the Dr. for the first time and Monday I saw him for an emergency visit. I got to meet the family dog, up close and personal! Both of us are OK--Doc gave me some antibiotics, just in case. Whew! what a week! Now poor Lizzie is not even allowed to watch me from afar. Mango lives in South Florida with Sandy. Georgie and Abby are inseparable best friends. Wherever Abby goes, Georgie follows, whatever Georgie plays with, Abby has to play with as well. One minute they will be quietly preening each other and in the next minute they can be found hanging upside-down together squawking and raising hell. Georgie just recently came to Pennsylvania to live with Abby and Mary Ellen. This is Caesar and his cage is "Caesar's Palace!" 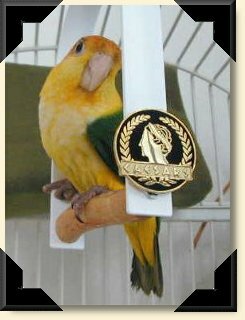 He is a true Las Vegas bird - loves entertainment and good food. Every morning he chirps a soft greeting as he peeks out of his happy hut, and right away looks for his favorite foods - grapes and corn on the cob. 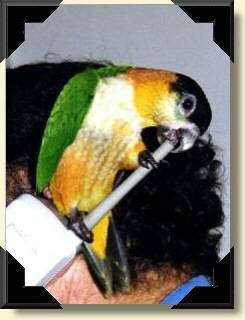 He loves to be cuddled and goes into a birdie trance when he gets his beak or head rubbed. We just love his adorable personality! Caesar lives in Las Vegas with Teddi & Mike. Pandora says "This ought to improve the reception!" About 4 months old in this photo, jumping on our heads and then going for the antenna is a favorite sport! 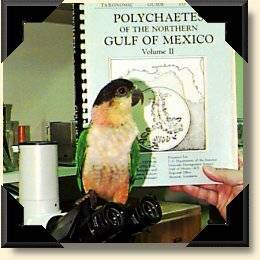 Pandora lives on Florida's west coast with Pat. Ashley and Melanie, what a welcomed addition to my family! These two are such well-adjusted individuals... You can tell that they were raised with lots of good food and loving! Ashley and I can often be found "cheek-to-cheek" whether sitting at my computer or running around the house. And little Melanie... she is so beautiful with her intense orange markings! 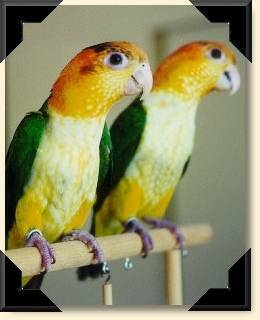 Of the four Black Headed Caiques that I have, not one of them is as stunning! 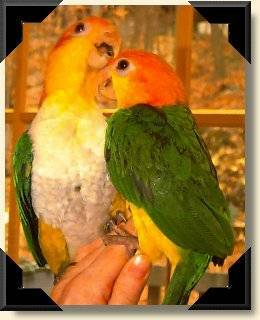 Ashley and Melanie live in New Jersey with Jan and the rest of her flock. Max, even at the tender age of six months, has quite an aptitude for science; here you see him working in the biology lab identifying "POLLY-chaete" worms. Max is everything I had hoped for in a companion parrot. He is a happy soul, equally pleased with lavish affection or playing alone with his toys. (Love those toys!!!) He is a whistler, and is quickly learning parts of actual tunes - but the most comical is when he "sings" to himself. Little under-his-breath whistles of complete contentment! Max lives in Florida with Kate. 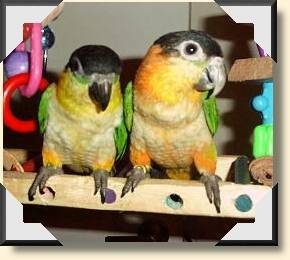 Our four caiques are housed in pairs, Pogo & Princess and Hekyll & Jekyll, but love to play together as a group on stands and a rope hammock. 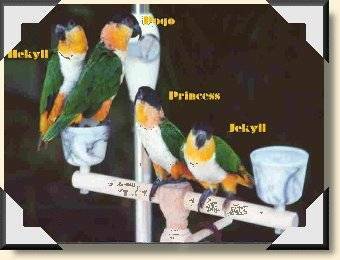 Their personalities are all distinct - Pogo is the ringleader; shy Princess adores him, but does annoy him with her "backwards walking" for Mom's applause. Hekyll-hen is cunning and quick, and Jekyll is just a goof who loves to eat. These beauties bring joy and sunshine every day to the Florida home of Margaret and George.